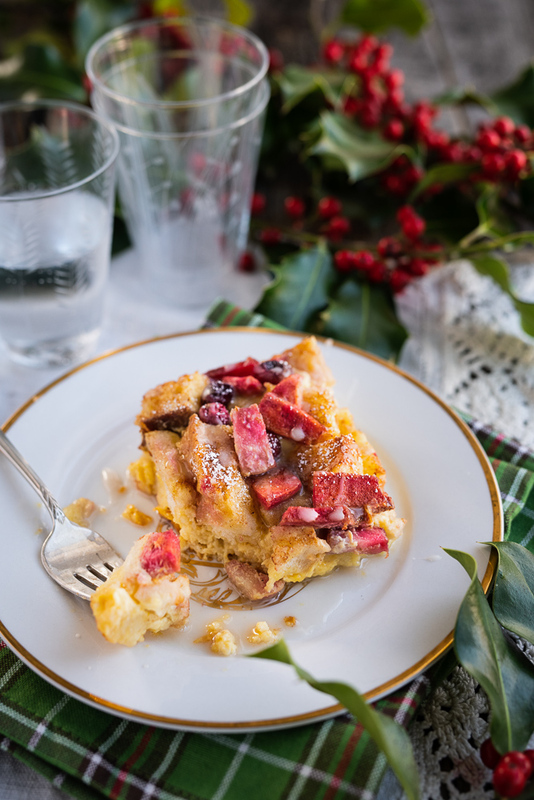 Kick off Christmas with our eggnog French toast casserole. This family-friendly dish is infused with eggnog, warm spices, apples and fresh cranberries. It also smells divine and will spread holiday cheer throughout your kitchen! To simplify cooking on Christmas morning we suggest you cube the bread the night before to let it dry out in a cool oven. Don’t worry if you forget, the bread can be lightly toasted on the day instead (see instructions in notes below recipe). You can also prepare the apples a day ahead but make sure you use our anti-browning kitchen hack to keep them oxidizing. Lucy GloTM apples and cranberries add a festive crimson touch to this holiday breakfast. Grease a 9×13 inch baking dish with either butter or a neutral tasting oil (ex. canola or sunflower oil). Distribute the bread cubes evenly throughout the dish, then sprinkle the apple and cranberries overtop. In a medium bowl, whisk the eggs until yolk and whites are well mixed. Add the eggnog and whisk again to thoroughly combine. Pour the eggnog mixture evenly over the bread, apples and cranberries. Cover with tinfoil and refrigerate for 30 minutes to enable the bread to absorb the eggnog. Meanwhile, preheat oven to 375°F / 190°C. In a small bowl, combine the sugar, cinnamon and nutmeg. Mix well then sprinkle on top of the casserole and cover with tinfoil. Place the covered eggnog French toast casserole in the oven and bake for 30 minutes. Uncover and bake for an additional 5-10 minutes just to brown. Be careful not to let it get overly brown or burned. The casserole is cooked when the middle is somewhat set. While the casserole is baking, make the glaze. Place the confectioners’ sugar in a small bowl and add the bourbon (or vanilla extract if using) and 1 tablespoon of milk. Mix well. The consistency should be smooth and very pourable. If needed, add extra milk 1 teaspoon at a time to achieve the desired consistency. 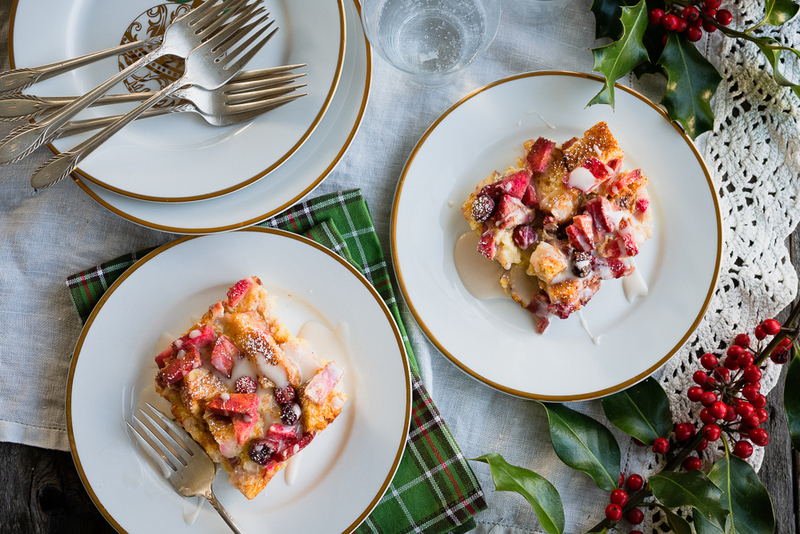 Remove the eggnog French toast casserole from the oven and set aside. Let cool for 5 minutes, then add the drizzle and serve hot. Suggested accompaniments include homemade applesauce, yogurt, and maple syrup. *Alternatively lightly toast fresh bread on the day in 300°F / 150°C oven for about 10 minutes, Try to color the bread as little as possible. We made these over the holidays and loved them. For some reason I ended up with lots of apples so I’m back to find another recipe to help me get rid of more apples. So happy to hear you loved our recipe, Janice! If you are looking for more apple recipe inspiration, you have come to the right place! We would love to hear what else you try. Enjoy!